Fiskars Paper Edgers are perfect for edging stationery, photographs, rubber stamp projects, stencil designs, and other creations. 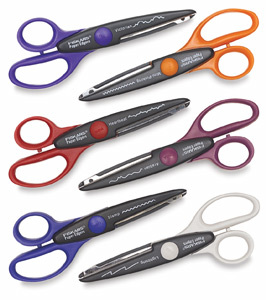 Edgers have many uses both around the house and in the classroom. Ergonomically designed handles are over-sized to fit comfortably in both left and right hands. Blades give long, clean, precise cuts. Choose from a variety of unique edging patterns. Contemporary Set — The Contemporary Set includes the Mini-Pinking, Lightning, Heartbeat, Arabian, Victorian, and Stamp Paper Edgers. 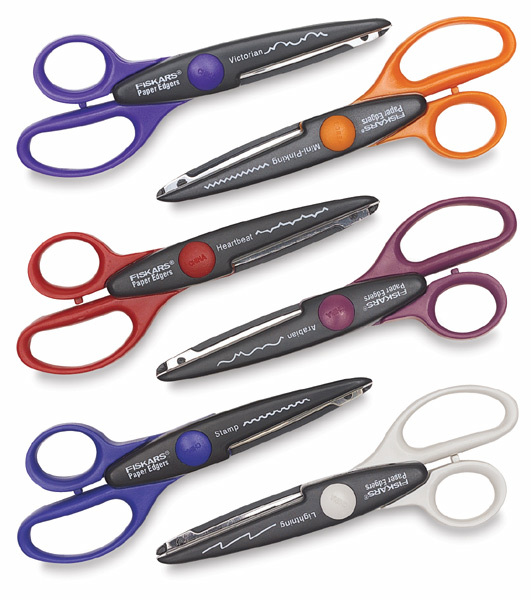 Regular — The regular sized edgers have a cut length of 2-7/16" (62 mm).